Friday 3 June marks 100 days since the EU abandoned its sanctions against Belarus, suggesting that a process of liberalisation in the authoritarian state merits such a decision. 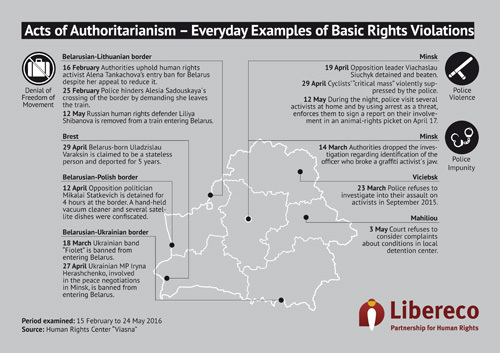 However, an analysis by human rights organisation „Libereco – Partnership for Human Rights“, on the basis of the monitoring of Belarusian organisation „Viasna“, shows that the country is still far removed from rule of law and respect for human rights. 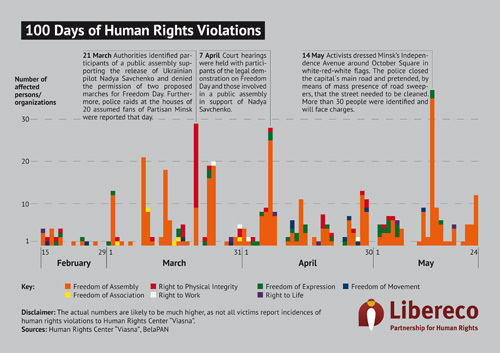 Repression has become less visible, but in several respects the pressure on civil society has been heightened. 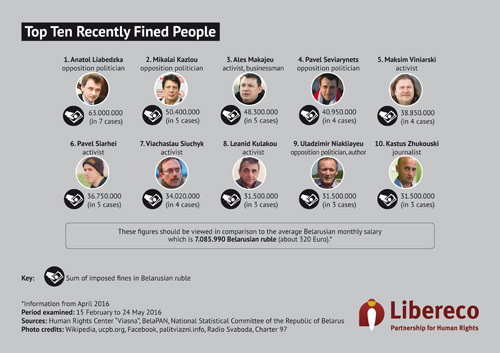 The significantly increased use of fines against peaceful protesters and the state’s intensified application of the death penalty, contradict the European Union’s softening attitude towards Aliaksandr Lukashenka´s regime. On 15 February 2016, the EU Foreign Affairs Council suggested lifting the sanctions against Belarus. Ten days later, the Council of the European Union inaugurated the proposal. 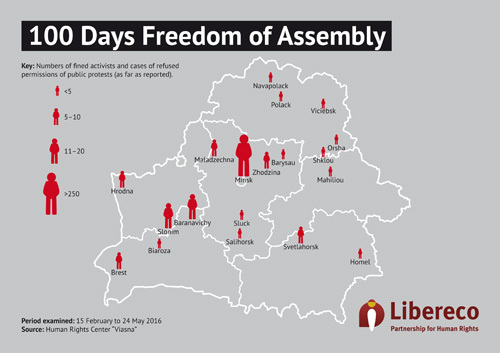 This is a benchmark in the EU´s political rehabilitation of Belarus, which has been ongoing since mid-2014. In face of the crisis in Ukraine and the deteriorating relationship with Russia, Belarus is welcomed as a supposed stable partner on the EU’s Eastern border. 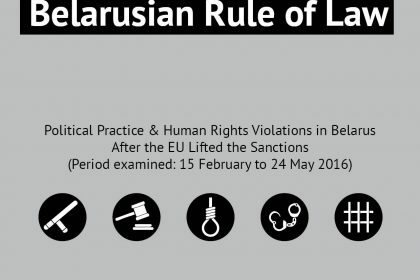 Nevertheless, the sanctions were originally introduced not out of considerations of international diplomacy, but to motivate Belarus to improve rule of law and reduce human rights violations. 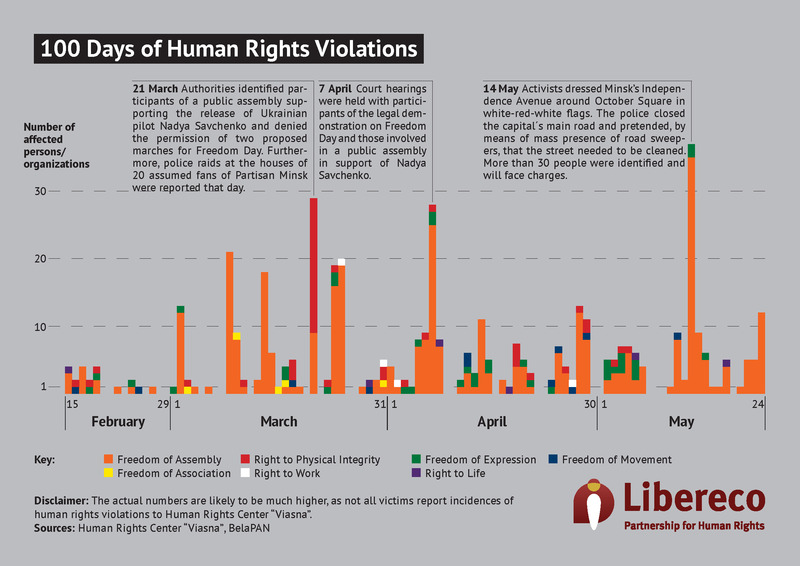 Libereco’s analysis of the 100 days following the abandonment of the sanctions evidences striking results. The situation of human rights has not improved and in several respects they have actually deteriorated compared to 2015. Punishments and harassments have been kept beneath a level which would attract international attention. The investigation period gives a particularly shocking image regarding the use of the death penalty. 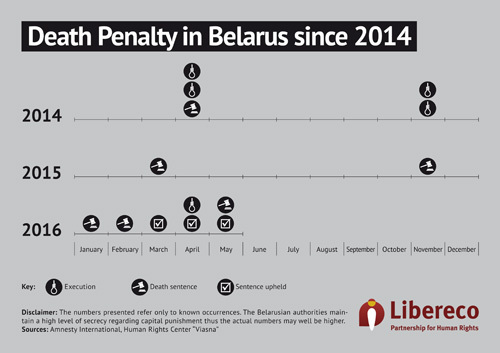 As the last country upholding capital punishment in Europe, Belarus does not appear to be decreasing its use of the death penalty. In the 100 days since the end of sanctions the amount of death sentences and executions exceeded those taking place in the whole year of 2015. “The death penalty is legalised murder. 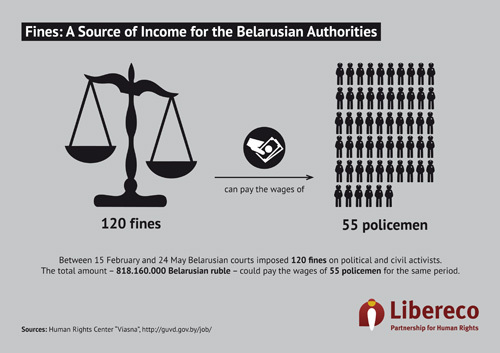 Every death sentence makes the Belarusian state a killer. 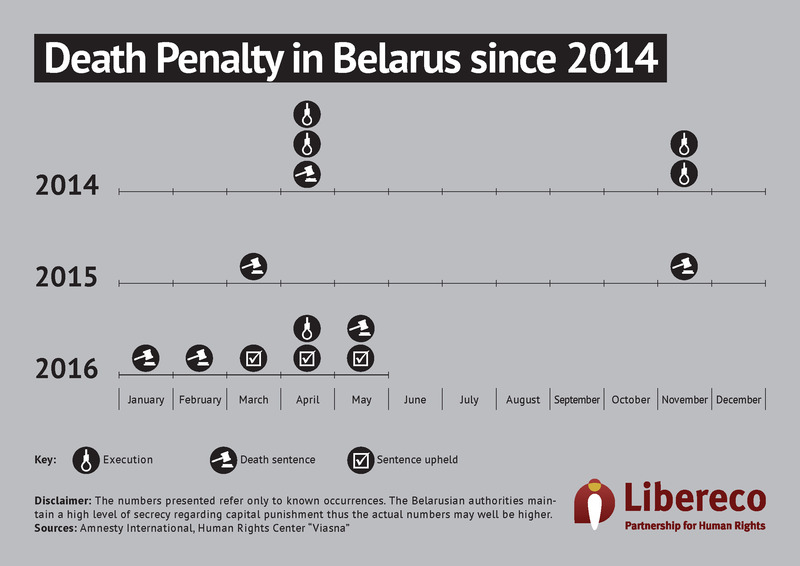 Recently, at an international UN conference, the government defended their actions, indicating that there is no end in sight for this inhumane practice” says Andrej Paluda, coordinator of the campaign against death penalty in Belarus. For example, the fining for participation in peaceful protests skyrocketed whilst publicity-provoking measures such as short-term imprisonment were used significantly less. 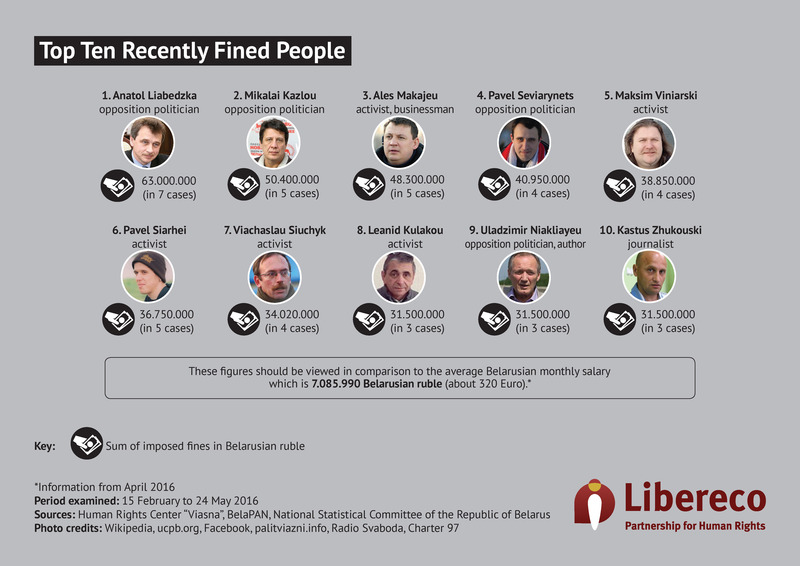 The amount of fines, imposed throughout the 100 investigated days could cover the salaries of 55 policemen for the same period. 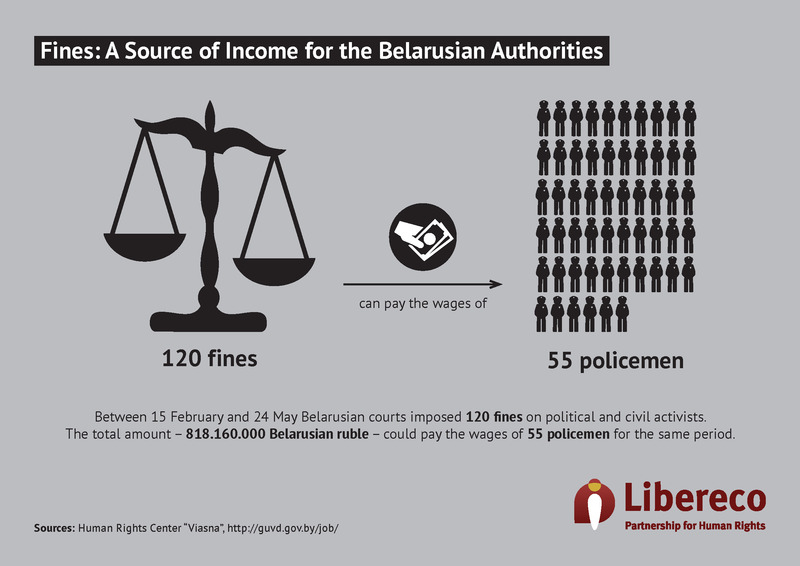 Despite of this, Belarusian authorities have managed to create a less repressive and more internationally acceptable image. An upcoming UN vote on the removal of the UN Special Rapporteur on the Human Rights Situation in Belarus might illustrate Lukashenka´s success – if the UN countries consider continual scrutiny unnecessary. Libereco joins the International Federation for Human Rights (FIDH) in urging the UN to continue monitoring the human rights situation in Belarus. 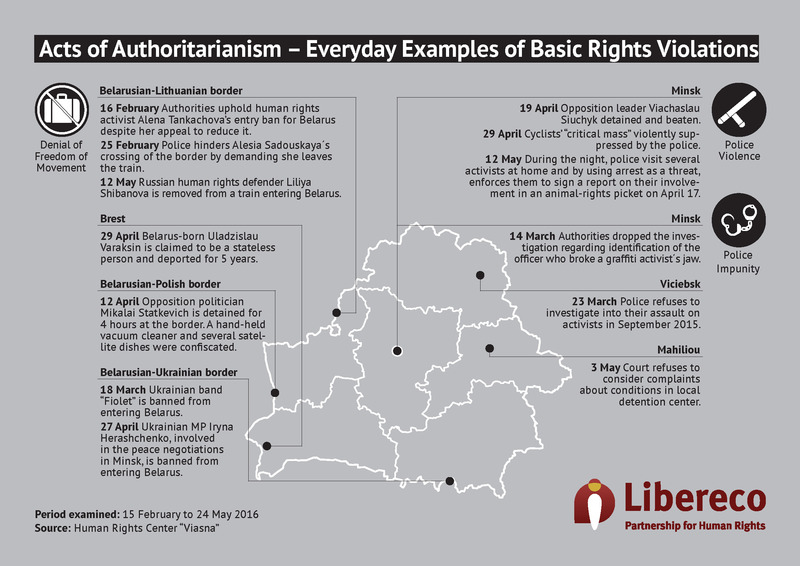 In fact, our analytical results prove that the Belarusian state still legitimates violations of basic rights against its citizens. We call upon the European Union to uphold its original values and to object to Belarus´ violations of human rights, including their use of the death penalty. The publication and its research was done by members of Libereco and Viasna who contributed voluntarily. We did not receive any financial support by third parties. If you want to support our work for respect for civil and political human rights in Belarus, you can donate to our accounts or via Paypal.